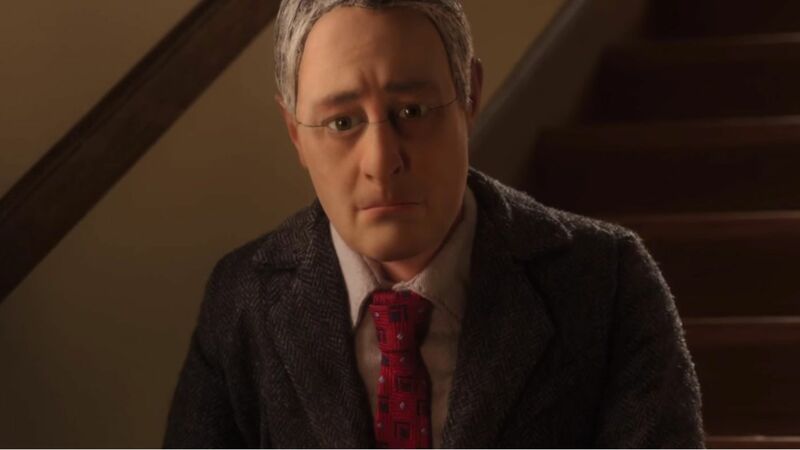 Anomalisa constitutes a remarkable emotional adventure. The heart soars when we understand the film as a sweet romance; a meeting of two souls who inspire one another to step out of the shadows and believe, perhaps, they're each worthy of the sun (and all the great things that radiate under it). Our butterflies, however, are shredded when we realise this may not be the case. Charlie Kaufman's latest film, co-directed with Duke Johnson, is a stop-motion animated feature located in Michael Stone's monochrome life. Stone (voiced impeccably by David Thewlis) is a respected author lecturing at Customer Service conventions on the wisdom found in his book "How May I Help You Help Them?" His colourless appearance - grey hair, white shirt, khaki trousers - shield the outside world from the civil war in Stone's mind. The aching mundanity of his humdrum life is exacerbated by the world around him in which each other person sounds the same as the last (Tom Noonan voices all bar the two main characters). Taxi drivers, his wife, the hotel manager and his son all share the same voice in Stone's world. '"Its boring," intones Stone. "Everything's boring." Everyone, we're led to understand, is the same until suddenly Stone's routine existence is broken by a voice unlike any he has ever heard. 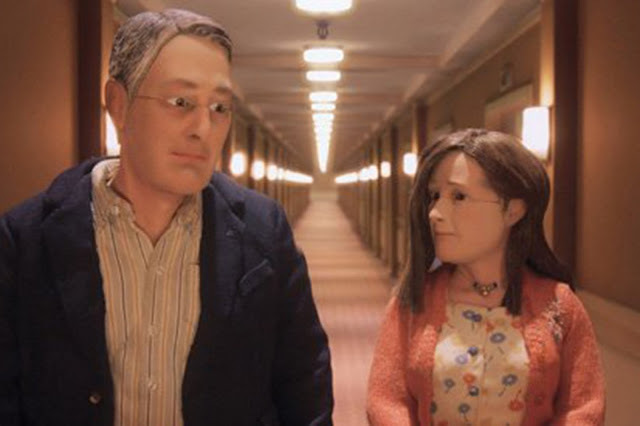 As Stone meets Lisa (Jennifer Jason Leigh), everything changes - to Anomalisa, and to Michael Stone, this is the equivalent of Dorothy stepping out into a world of colour. Self-deprecating, overly apologetic and clearly lacking in self-esteem Lisa considers herself unworthy of Stone's attention despite his stoic insistence of her special nature. "I think you're extraordinary" Stone remarks touchingly. Lisa questions him as to why but our hero is undeterred: "I don't know yet, it's just obvious to me that you are." Kaufman's ear for obtuse humour punctuates a remarkable evening Michael and Lisa spend together. She has found someone who will listen to her thoughts and he, in a world of noise, has found someone finally worth listening to. The conversation spans from pathos to bathos as Stone listens to Lisa unspool her feelings to him with a series of often unintentionally revealing statements. Of Cyndi Lauper she exclaims: "She's just herself and that takes a lot of courage. I admire that." Kaufman has tricked us into believing we've witnessed a perfect, albeit unconventional, movie romance until we suddenly, and uncomfortably, notice the subtext which creeps into the frame. Have Michael and Lisa truly found soulmates in one another or are they each just customer service providers to the other? Is the connection they've made truly any more profound than, for example, a complaints call we make to our banks? Have they, in projecting their desires onto each other, undertaken little more than providing a service to one another - a service, a transaction, which allows them to forget that each of us is alone in an infinite universe, slowly and inevitably dying? As Stone remarks at the conference to "think of the customer as a friend", Kaufman makes us draw parallels between the inane superficiality of customer services and, often, how we relate to one another even in our most intimate moments. "What is to be human? What is it to ache?" asks Stone in his speech and, in doing so, provides the philosophical questions at the heart of the movie. Anomalisa shows us an animated world quite like our own; wearisome, pedestrian, throbbing with melancholy. Yet, amongst the unremarkable we can find cracks of sunlight we can delight in walking in. We remember the passion in Stone's voice as he tells Lisa: "Everyone is one person but you and me - you're the only other person in the world". To answer Stone's earlier rhetorical question: it is in tender moments like this, full of yearning and pain, euphoria and doubt, which make us human. Kaufman has once again poetically captured the human spirit, as depressing as that may be.